A man in armor has kneeled over two circles painted on the floor. In his left hand he holds an open book and a pen in his right, with which he is drawing intriguing, perhaps alchemical, symbols on the outer rim of the circle. Seven symbols are visible, but their meaning unknown to us. The man has a firm look in his face, and he seems to ignore us while being focused with his work. The open book and the pen are symbols of wisdom and understanding, but what do the symbols tell us? Beside him two pillars support a platform, on which in turn two more pillars are placed. Along with these pillars, two more men stand, helping the pillars support a second platform. We immediately notice that these men look very closely alike, likely suggesting to us that we are seeing the same person — master Achille Marozzo himself. These figures are armored as well, one of them armed with a sword hanging from his belt, resting his foot on a feathered burgonet. His right hand is clenched in a subtle fist and he fixes his eyes toward the viewer with command and evaluation. The other man rests his right foot over a shield and he is armed with a two-handed sword, against which leans lightly against left hand, with point fixed on the platform. With his head and eyes he directs our attention upwards. On the highest platform we find again an armored man, sitting on a throne with other paraphernalia symbolizing power and sovereignty. 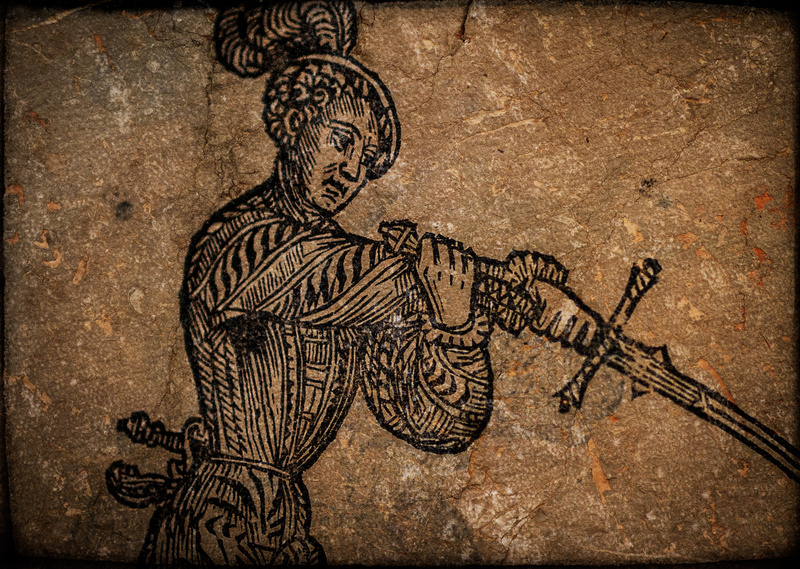 Our man now wears a crown in his head, and the sword is now drawn from the scabbard. He holds it upright, with his index finger overlapping the cross guard as is customary to the style of swordsmanship he embodies. 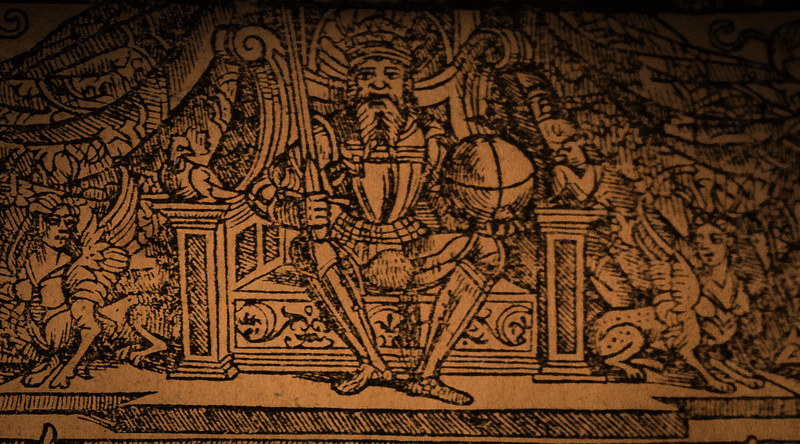 In his left hand a large orb stands for his wide-spread influence. Two hawks occupy the arm-rests of the throne, themselves symbols of high-status and ferocity in the hunt. The master’s eyes look at the viewer, perhaps with a little wear. The look is slightly aligned off, without the sharpness of the second man we studied. Confident and peaceful, he bids us welcome to explore the Opera Nova further. But even so his presence remains somewhat enigmatic. This sensation is furthered by the two Greek sphinxes guarding his throne. On both sides, facing away from the throne but with their heads towards the throne with gentle faces, these winged creatures symbolize a riddle. A riddle of steel in this case, as in the center of all a wooden frame surrounds the full title of the work: Opera Nova de Achille Marozzo Bolognese, Maestro Generale dell’Arte dell’Armi (A New Work by Achille Marozzo Bolognese, General Master of the Art of Arms). The base level represents the (secret?) knowledge on which the art is based. Curiously, behind the master is depicted both a landscape and a cityscape. The background fabric otherwise encompassing the scene is pulled aside, revealing this imagery, perhaps suggesting of Marozzo’s roots. He was originally from the village of San Giovanni in Persiceto, some twenty kilometers to the northwest of Bologna. Standing with the pillars, the two figures supporting the highest platform represent the life-long study of the art, perhaps also pointing to a military career. The pillars behind them are fixed and ageless, perhaps signifying the ancient tradition of this exercise. But the other half of the final achievement relies on the strong arms of living men. One of whom involves the viewer with a firm look to take part in the the practice of this art during times of great change in the history of swordsmanship1. The highest platform seems separate from the rest of the image, puzzling and unreachable. Perhaps it was isolated for a reason. Being a general masterAchille Marozzo was not like any other master of the art of arms, but a higher master or a master among masters. Whatever the meaning of his title and the nature of his status, the way he depicts himself sends a clear message. While he is here to share his knowledge, he enjoys the sovereignty of his throne. Marozzo was 52 years of age at the time when Opera Nova first came through the printing press in the year of 1536. Only five years earlier the city of Bologna granted him permission to power a spinning wheel using the flow of the Reno channel next to his house. Before his death in 1553 he likely devoted more time to this business. After his death in 1568, his son Sebastiano commissioned yet another printing of his father’s book, but due to multiple reprints in the years between the original woodcuts had been worn out. Hence new illustrations on copper by were etched by brothers Giovanni and Gulio Battista Fontana. Among these new illustrations was a new frontispiece, beautiful in its own right, but emblematic not only to a late master swordsman but to a successful textile entrepreneur. The publisher has been given ample space for his own insignia at the bottom, the entire composition being replaced by a large frame, still centered with the updated name of the work. On the shoulders of the frame three women sit, spinning yarn, thus making an unmistakable connection to the business of Marozzo during the last chapter of his life. One may wonder about the master and the objects he preciously had in his possession in the original frontispiece. Well, the swords and shields are still there, placed above the frame almost as if touching the heavens, but only barely visible and effectively shadowed by the frame. The master has gone and so has the position he occupied. No longer is there a maestro generale, neither a throne, a crown nor an orb. But his riddle, it remains. 1) The rapier styles of masters such as Capoferro, Giganti and Fabris were to become popular during the following century, and were already hinted at by so-called transitional style masters in the late 16th century. 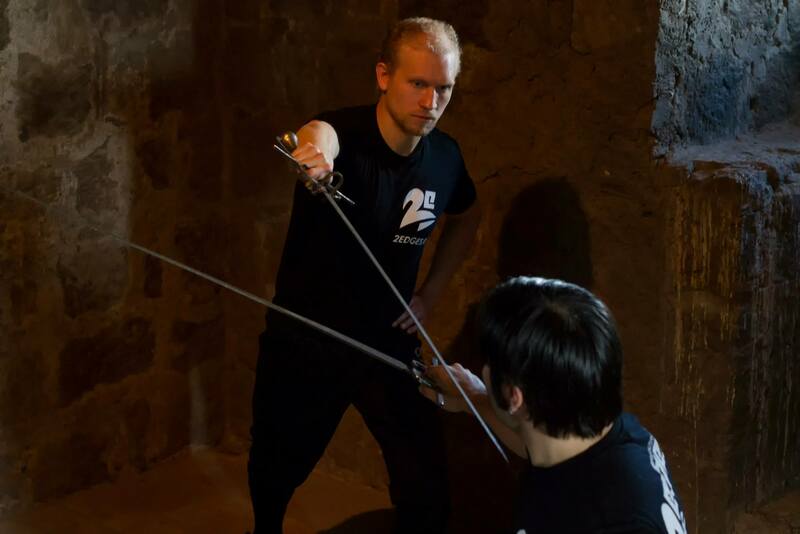 Marozzo devotes one-third of his chapter on fencing with the single sword for ways of countering the direct thrust towards the face — possibly in anticipation of these changes. I am indebted to Roberto Gotti for pointing this out to me and inspiring me to write this essay.